“Schizophrenia” is by many accounts the most devastating illness of our time. In this book, Elahe Hessamfar uses her personal encounter with her daughter’s illness to bring the reader to experience the pain and anguish of those who suffer so intensely. She candidly discusses the gripping and dark realities her family has faced in the midst of this journey and exposes that the ride isn’t easy, but it can be fruitful and purposeful, and it can be a journey of joy and peace if understood from the intended perspective. This is a fascinating and deeply theological portrayal of madness under the mighty hand of God. It challenges and awakens the reader to a heightened awareness about self, community, pain, brokenness, sin, grace, and redemption. This is the first truly biblically based, theological interpretation of madness in conversation with psychiatry and social sciences. Hessamfar passionately discusses the shortcomings of our current medical model of mental illness and directs the reader’s attention to the mistreatment of those the medical community labels with “schizophrenia.” She argues that not only is “schizophrenia” not pathological but it touches on the most fundamental fragilities of the human soul, and hence, it is a critical pastoral issue. Hessamfar offers tangible, inspiring, and life-changing solutions for those dealing with this most elusive and mysterious phenomenon–solutions that would bring hope and healing to the hopeless people chained in the abyss of madness. …..the history of encounter with illness has proven that illnesses demand to be studied from different perspectives. All illnesses bring about both physical and psychological suffering. Moreover, all illnesses create spiritual suffering by exposing the fragility of the human condition. Severe illnesses, such as “schizophrenia,” touch us in our core and force us to question ourselves, our values, our way of life, our relationship with God and others. Moreover, they can bring us face to face with our inadequacy, and with the lack of control we have over our lives. They humble the spirit like nothing else, forcing an encounter with our own mortality and destroying our false sense of equilibrium. They not only have the power to free us from that innate self-reliance and pride that renders us weak in our walk with God, but also have the force to call the afflicted and those around him to repentance. Therefore, illnesses are both theological and teleological by nature. This profoundly insightful resource is a masterful formulation of biblical anthropology, providing one of the best – if not the best – ground-level theological examinations of madness in recent years. With scholarly finesse, Dr. Hessamfar brings transparency, wisdom, and theological reflection to a perplexing and terrifying affliction. Giving a personal voice to those traversing the dark mysteries of extreme mental anguish, the author suggests that the journey is far from random meaninglessness, and as such, serves as an exhortation to the covenant community to embrace afflicted souls and their families effectively and faithfully. Concerned with the application of biblical revelation to the human condition, and offering hope to the hurting, this well-written exploration brings spiritual sanity to an affliction that too often is avoided, to the detriment of the Christian community. We live during a time when in-depth knowledge often stands by itself, partitioned from any conversation with its neighbors. The greater the depth, the more isolated the information. Elahe, in contrast, does us a great service by bringing together theology, biblical interpretation, psychiatry, pastoral care, and personal experience. She has given us a foundation for thoughtful care and ministry that is crammed with possible applications. A demanding book. Although it is a very serious subject, it is written in a beautiful way and with clear purpose: to make a change. A truly remarkable and unforgettable book. By narrating life with her daughter with a crisp accuracy and brutal honesty, Elahe Hessamfar brings before us some hard theological questions. Her analysis is full of insight about how we might think about the shape of Christian hope and witness in the shadow of such threatening conditions. Hessamfar marshals experimental data, candid admissions by bewildered psychiatric experts, and the narrative voices of people labeled ‘schizophrenic’ to show that the psychiatric establishment has failed to show that ‘schizophrenia’ is a unified syndrome. Beyond exposing this failure, Hessamfar gives compelling reasons for thinking that the church ought to get off the sidelines and take up the task of caring for people with the full range of healing modalities suggested by a biblical anthropology. She argues convincingly that building relationships of love and trust with patients by listening carefully to their voices will be a vital first step in a biblically sound approach to caring for those now dismissed under the classification ‘schizophrenic.’ Hessamfar’s scholarship is extensive, ranging from the complex world brain physiology, to the discourse of philosophical critiques of the medical establishment, and to spiritually rich works of theological anthropology. 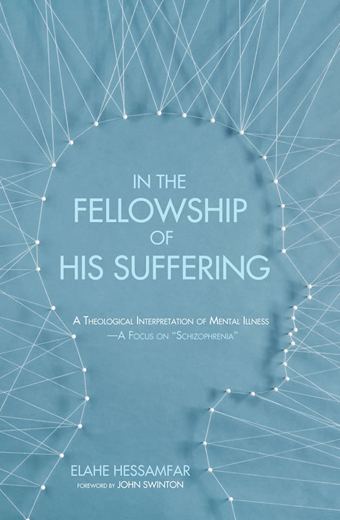 This book demands the attention of anyone who is genuinely concerned about ministering to those struggling with a diagnosis of schizophrenia.